The day started out like any other – two cups of coffee and too many things to do. I replied to the last few emails that lingered in my inbox for a week. I hit the send/receive button and seven more emails floated in. Crap! I’m already late for work and have way too much to do! In that moment, I wished…just for today, let my to do’s be done! Huh, just for today. I like it. When you think about it, all we have is today. Yesterday is just a wrinkle on our foreheads and tomorrow is merely a dream. I let the words settle – just for today. I closed my eyes and let my mind wonder. Hmmm…Hours? Minutes? Or better yet, moments. Each moment is here, it’s now, but then gone. How many moments would it take before my to do’s would be done? What if you had to endure 50 moments of disappointment, frustration, or pain before everything would change? If you knew that number ahead of time, you’d countdown each heartache and focus on the result. Picture it…Only 30 more letdowns and victory is mine! Yippee, 10 more moments of hard work and I’m done! But since no one knows how much they’ll have to endure, heartache isn’t something we can tick off a list. So instead of persevering through the difficulty, we quit – throw in the towel – or totally give up. Or live life stressed for no specific reason. What if you quit 2 moments too soon? What if the season of change was only 1 moment away? I can’t even imagine what I’d be doing right now if I’d stopped writing just over a year ago. I hadn’t yet finaled in the Golden Heart, and getting my book published was merely a dream. Wow. I’d better get back to those emails and finish writing that sequel. And if I think about doing it, just for today, it doesn’t seem so hard. 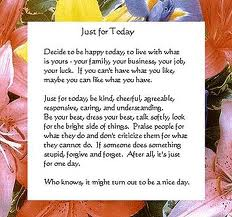 Just for today…I’ll keep on trying. I love it! Thanks! You know the drill. Just blog!